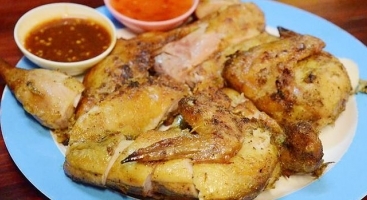 Contrary to popular belief, Lao Cuisine is not the same as Thai Cuisine. Lao food has its own signatures and deserves recognitions for creativity and genuineness. There is a variety of dishes with many kinds of appetizers, salad, rice, noodles, stew as well as deserts and various ways of cooking methods such as grilling, steaming, frying, searing and mixing. The most special thing is that materials for cooking in Laos are totally fresh. Most of them was obtained from hunting in the forest and immediately cooked without storing in refrigerator. Eating customs in Laos is very special. Like Indian, some kinds of food required eating by hand which will be a life-time experience for tourists. Sticky Rice is the main food of the Lao. Sticky, or "glutinous" rice has been growing in mainland Southeast Asia for at least 4,000 years. 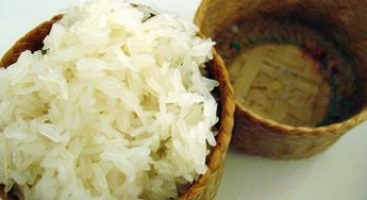 Unlike Khao Chow, which is jasmine rice, sticky rice is always served in a bamboo basket. It would be a pity if coming to Laos without tasting Laarb. Laarb is a type of tossed and seasoned salad made primarily with chicken, beef, duck, fish, pork or mushrooms, flavored with fish sauce, lime juice, padaek, roasted ground rice and fresh herbs. Pronounced Guy Yong, this is a well seasoned grilled young and very lean chicken which taste similar to Chinese spare ribs (but better). 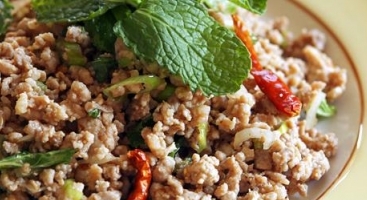 Being a typical Laotian dish, it is often paired with Som Tam and sticky rice. 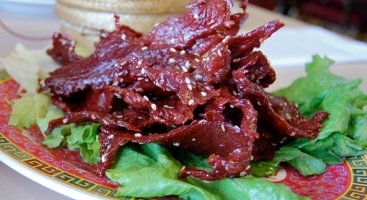 Sundried beef strips, good with Beer Lao or as a snack. Made from beef flank steak (sometimes water buffalo meat is used), marinated in a mixture of garlic, fish sauce, ginger, sesame seed, sugar, salt and black pepper. Kaipen is produced in the city of Luang Prabang in Northern Central Laos. During the hot dry summer months, when the river level is at its lowest, the green algae, called kai, is gathered from the river bottom. 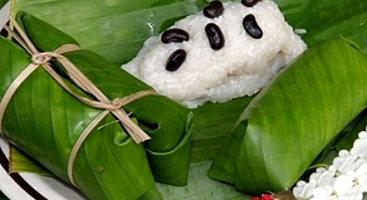 Khao Tom is a Laotian and Thai dessert of seasoned steamed sticky rice wrapped in banana leaves. This dessert can be either savory (filled with pork fat and mung bean) or sweet (filled with coconut milk and banana). 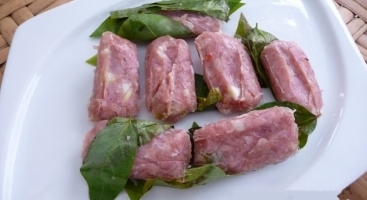 Som moo, literally "sour pork", is a type of fermented or soured Laotian pork sausage that is a very popular staple. 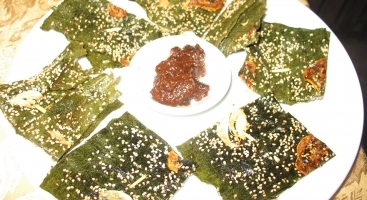 It is made from raw pork consisting of rump and it typically is made with pork skin. 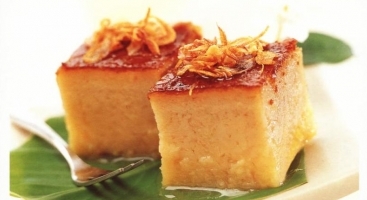 Khanom Maw Kaeng is one kinds of egg custard pudding made from Taro, mung bean, coconut milk, egg, sugar. It is very soft, sweet and tasty. 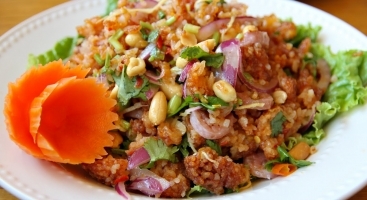 Fried Rice Ball Salad - Nam Kaow is a mixture of crispy fried rice, preserved pork, green onions, and lime juice. 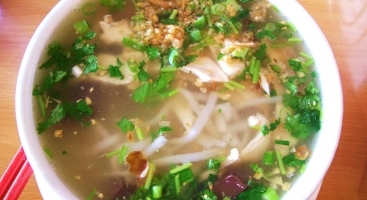 It is one kind of noodles very popular in Laos. Made from chicken meat, topped with shallots and garlic, sliced green onions and cilantro and sweet soup, Kaow Paik looks very delicious.